A wedding script helps everyone know what to do. Write a script for your wedding ceremony to ensure everyone participating knows what is going on. Full scripts keep weddings on track and help to eliminate any wedding oops that might otherwise occur. Having a script for the wedding ceremony is an excellent idea for brides or bridal consultants who are planning an elaborate ceremony or one with a lot of people involved in the ceremony. Provide the script to everyone who is at the wedding rehearsal. A script serves several purposes for the couple. The main purpose of the script is to provide detailed aspects of information about the ceremony to those involved. This way, everyone knows what is going on without waiting to be told. If the people who are reading wedding day poems or Bible verses forget their copies of the readings, they will have the words in the script right in front of them. Moms who are helping their children light unity candles will know their cue for walking to the altar and performing the task. The script is also helpful in case of an emergency. Should a bridal party member or ceremony participant fall ill, someone else can step into their role with less confusion by following the script. The other major purpose of a script on the wedding day is to calm everyone's nerves. Not only are the bride and groom nervous, but some officiates, bridal party members, parents and even readers are also sweating their roles before the ceremony begins.The script is something that participants can refer to, either during the ceremony or just before the ceremony begins. Children who are reading blended family wedding vows might appreciate having a script in front of them during the vow portion, as they may be anxious about their part in the ceremony. Writing an entire wedding ceremony script is much more involved than completing a wedding ceremony outline. Everything that is taking place in the ceremony, from dimming lights to cueing music, should be included on a wedding script, just like any other performance script. In fact, some brides might even prefer to have the script written with entrances and exits, and even block off places for people to stand during different parts of the ceremony. Scripts follow the order of service. In addition to writing out directions for when and where people need to be, include full write-ups of the different wedding readings included in the ceremony. This way, no one needs to worry about forgetting their "lines" or losing their place with notecards. Use the written wedding program as an outline, using each item as a new section. Write out any spoken words that are included in each section, along with who says them and where they are to be said. Add any directions into the section, such as "dim lights after wedding processional is complete." After completing the first section, move onto the next. Once the entire script is written, have someone else involved in the wedding check it over for any mistakes or confusing areas. Make enough copies of the script for everyone who needs it, from the pastor to the photographer to the bridal party. Spoken words that may not be included in the script are personal, romantic wedding vows written by the bride and groom that they do not want read until the actual ceremony. 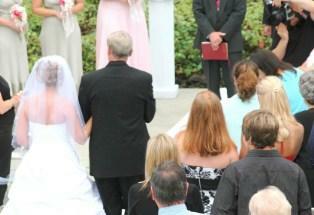 Additionally, a pastor may not want to share his sermon until the actual wedding ceremony. A wedding ceremony script is a useful tool for busy brides, grooms and others who are taking part in the ceremony. Write it several weeks before the wedding and revise during the rehearsal to maximize the script's benefits.